Here, it's all about you! Our full-service, independent financial center provides a professional team that has the power to help you work toward your life goals. With abundant energy and passion for each client relationship, Lori makes time to help her clients understand key investment and insurance principals to make informed choices. Committed to being a life-long learner and a Leader of leaders, Lori brings 30 years of diversified financial, insurance and technology experience to help individuals and businesses succeed. The mother of two recent college graduate sons, Lori is an accomplished leader and speaker in her community, sharing talents with many professional associations, community service organizations, and her church. 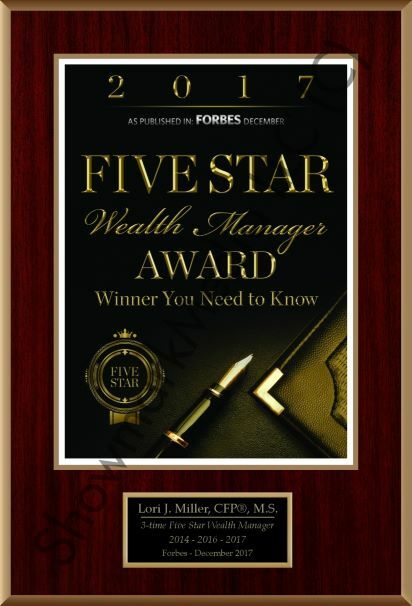 Most recently Lori received the 2017,2016, and 2014 Chicagoland Five Star Wealth Manager Award**, the 2015 "Best of Wheaton Small Business Financial Services Award*", the 2014 Exceptional Engagement Award, an outstanding leadership award from the Wheaton Chamber of Commerce, was a finalist for the Wheaton Citizen of the Year in 2013 and was the founding recipient of the Women in Business "Pillar of the Community" Award. Lori is an avid road cyclist, serves as a non-partisan debate moderator, enjoys skiing, cake decorating, reading, and sharing time with her family and friends. Lori is an overall Gold Medal Age Group Winner for the Chicagoland Indoor Triatholon Series for 2010 and Silver Medalist for 2012 to benefit MS, and the overall Gold Medalist for her category for America Bicycle Racing in the Midwest Area Time Trial Series for 2010 and 2012. She served as a Charity Cycling Team Coach to bring awareness for diabetes and MS. Her lifelong passion is to make positive differences in her relationships and community, while helping clients work towards financial freedom. Call Lori today at (630) 690-0000 to see how she can be a value-added resource for you, your business, or loved ones. **Award based on 10 objective criteria associated with providing quality services to clients such as credentials, experience, and assets under management among other factors. Wealth managers do not pay a fee to be considered or placed on the final list of 2017, 2016, or 2014 Five Star Wealth Managers.